President-elect Obama’s transition officials are in early talks about making significant cuts in some high-priced weapon systems, seeking savings to offset budget deficits and help pay for arms sought for conflicts in places like Afghanistan and Iraq. 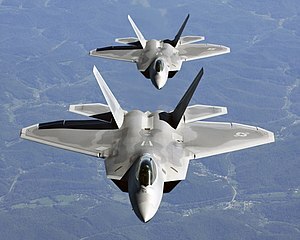 Defense industry executives say the first cuts may be seen in the fiscal 2010 Pentagon budget, which Mr. Obama will send to Congress early next year. An executive with a top 10 defense contractor, who asked not to be named, said his deeply concerned industry had hoped the cuts would not come until the 2011 budget, but the transition is now discussing an accelerated process to free up money for immediate war-related items and for domestic programs. Three defense executives with contacts in the Obama transition told The Washington Times of the budget talks – but also said no final decisions had been made. “They could do something as early as the 2010 budget,” a second executive said, referring to the fiscal year that begins Oct. 1. The issue has become more acute as the federal budget deficit balloons in the face of huge bailout legislation and a decline in tax revenues because of the economic downturn. Bailout packages approved or in the works – including potential government obligations such as loan guarantees – total more than $8 trillion thus far, amid expectations that the worst of the recession is yet to come. Military spending was not a big issue during the presidential campaign. But in several speeches, Mr. Obama indicated that he will cut funding for some expensive systems. In particular, he mentioned “slowing” procurement of the Future Combat System (FCS), an array of land and air combat vehicles designed to take the Army into the next generation of warfare. Advisers have told Mr. Obama that the FCS program is wasting money as it fails to produce the new systems and that funds could be better spent on current war needs. You are currently browsing the archives for the domestic spending category.